There are iOS and Android versions of all the major Office apps including Outlook, Word, PowerPoint, and Excel. You might not want to work on your company’s annual budget or write your magnum opus on your iPhone, but to quickly check on a document someone else is editing or to tweak something before sending, the mobile apps are great. And they’re free. Outlook for iPhone gives you your email, calendar, and address book — with access to all the same data as the PC or Mac versions. Word, Excel, and PowerPoint for iPhone are scaled back versions of these apps, but still useful. And did you know you can cast a PowerPoint presentation to an Apple TV and some smart TVs? That lets you give wireless presentations while holding the controller in your hand. SharePoint is a bit of a challenge, but your friends at EXP are happy to help you get started on it. In the meantime, take a look at OneDrive. Every licensed Office 365 user gets one terabyte (1TB) of storage in the cloud. That’s a ton of space! It’s also better than using your local Documents folder since OneDrive automatically syncs to the cloud, so if anything happens to your computer, your data is still safe. OneDrive is easy to use and works basically the same way as DropBox or Google Drive. All you need to do is install the app on your computer, sign-in with your Office 365 credentials, and let the tool sync your data to the cloud. Plus, there’s an iPhone app for this one, too. 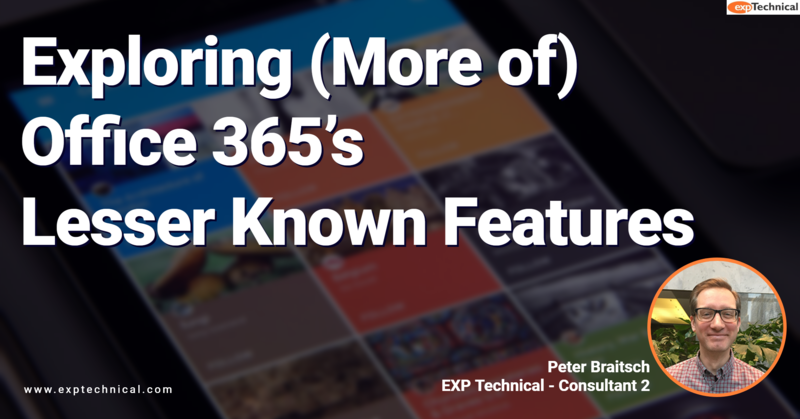 Using these and other useful if overlooked tools will help you get the most from Office 365. Want to learn more about optimizing your current IT tools & solutions? Click here to register for our upcoming Lunch & Learn: Optimizing Storage and Collaboration in Cloud!